Joan Myers Brown founded Philadanco in 1970. The company dances all over the world. 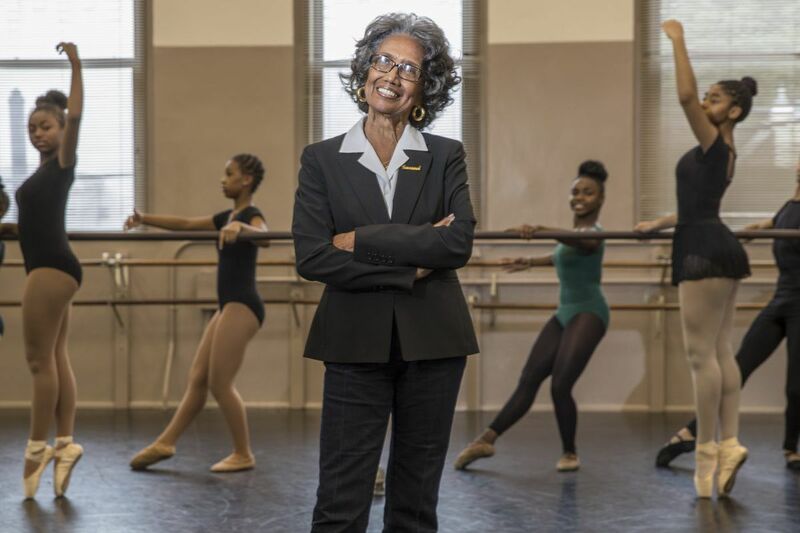 Joan Myers Brown is not just the founder of Philadanco, the Philadelphia modern dance company. She also has made it flourish with vast amounts of heart, talent, and even cash. In a world where dance companies invariably struggle for dollars, Brown has kept her troupe going for 47 years. A resident company of the Kimmel Center, her group has received a steady stream of accolades, forging a reputation as one of the nation's leading modern-dance companies. Often, though, the kudos haven't been enough. To make ends meet, Brown has lent the company hundreds of thousands of dollars of her personal money. The company's 2014-15 tax return lists a $718,391 loan from Brown, an indication of how Brown stepped in when corporate and foundation gifts dried up. Joan Myers Brown, pictured in 2010 with dancer Justin Bryant, has received a steady stream of accolades. "When they don't save me, I save myself," said Brown, indomitable at age 85. For all these reasons and more, Brown has been chosen as a member of the Philadelphia Inquirer's Business Hall of Fame in recognition of her professional achievements. "She's a national icon," said Brenda Dixon Gottschild, author of Joan Myers Brown & the Audacious Hope of the Black Ballerina. "She has really fostered a unique aesthetic that I see as very particular to this incredible city that we live in." The waiting room of Brown's West Philly studio — on Philadanco Way — is stuffed with such accolades: Three honorary doctorates, a Master of African American Choreography medal from the Kennedy Center, and the 2012 National Medal of Arts, a commanding piece of hardware on a purple ribbon given by President Barack Obama at the White House. Joan Myers Brown before President Barack Obama presented her with the 2012 National Medal of Arts. "But they don't come with checks," Brown notes. "And it sounds trite, but trying to support an organization where the demands are not what I think I need is hard. "I say I have 'Founder's Disease.' I'm always founding things. But I always found things out of a need. Whenever I found a need, I thought, 'How can I fix that?' "
Even if it means working on a shoestring. Brown said that from the inception of the school that began in 1960 and the company in 1970, "the money was always separate for nonprofits of color. If it weren't for government funding, we wouldn't have survived." In the early days, there were more lucrative tours and corporate funding. The company performed out of town 40 weeks a year. But many businesses that supported the arts left Philadelphia or merged, and the large foundation grants on which so many other troupes depend never materialized for Philadanco. Touring has slowed. Joan Myers Brown received the Philadelphia Award in 2010. As with many dance companies, Brown's school — the Philadelphia School of Dance Arts — helps pay the company's bills. Brown has locations in West Philadelphia and West Oak Lane and runs three junior companies for dancers age 8 through 23, along with the main Philadanco company, which tours the world. She has founded numerous organizations, including the International Association of Blacks in Dance. She began an audition program to introduce black ballerinas to companies that don't look much like America. But her business gets by with just one full-time and two part-time administrative employees. "The rest I try to make happen myself," said Brown, who often works 9 a.m. until midnight or later. "I'm a one-woman show." Brown owns the three-story building in West Philadelphia that houses her studios. She also owns two houses that she converted into four apartments. Dancers live in three and visiting choreographers stay in the fourth. Since the beginning of her career, she recalled, "I've sort of always been fighting for something." "When I was in high school, and my gym teacher put me in the ballet club, I was the only black girl. I was looking for a place to study in Philadelphia — we're talking about 1948, '49 — there were no schools that took black girls." The outlook was no better for a dance career. "Nobody was hiring anybody black in ballet," Brown said. Legendary ballet choreographer Antony Tudor suggested that Brown would have better luck in New York. "But you're talking about '49, '50s. Black girls weren't leaving home. All girls at that time. You stayed home until you got married or went to college." So Brown got married. But her first love would not be denied. Joan Myers Brown teaches a student in her previous studio at 63rd and Market in June 1977. "I couldn't be a ballet dancer, but I got an opportunity. The opportunities to dance professionally were all nightclubs. But I was lucky. I ended up dancing with top shows, like Pearl Bailey, Sammy Davis, Nat King Cole, of that era." Sometimes they'd ask her to put on pointe shoes. But one night in 1960, in a sad hotel in Boston, she had enough of life on the road. "I said, 'You know, I'm going back home, and I'm going to teach some kids. Maybe somebody will get a chance I didn't get.' So I started my school, with my mother's friend's kids, at 52nd and Walnut. And I started off with 30 kids." In the early days, though, the school was not enough to pay the bills. So she went back to nightclubs and began riding the bus six days a week to Atlantic City to dance and back to Philadelphia to teach. After six years, she had enough students that she could make it her full-time job. The plan was only for a school, but after 10 years, her students began looking for company work. Again, no one was hiring. So Philadanco was born. In the early years, the company worked for free, dancing at women's clubs and recreation centers. "We just started dancing around," Brown said. "We got invited to Camden, we thought we were touring." The girls needed partners, so she recruited basketball players from West Philadelphia High School, who were game because they thought the girls were cute. Joan Myers Brown (left) with Philadanco dancers in April 1985. Those who passed through the company or school included Robert Garland, resident choreographer of Dance Theatre of Harlem; Lee Daniels, who created the TV series Empire; Leslie Odom Jr., who played Aaron Burr in the original Broadway cast of Hamilton, and Hope Boykin, a choreographer and longtime member of Alvin Ailey American Dance Theater. Philadanco has performed in 48 states and 20 countries. Her dancers are at work 52 weeks a year, a rarity in a field that regularly lays off dancers for weeks or months at a time. But making ends meet has gotten only harder. "Running an arts institution is different from running anything else," Brown said. "Unless it's a major museum or the ballet or the opera or the orchestra where they have patrons who support them, they're operating $8 [million], $9 million budgets. Mine is $1.3 million" in a good year. Pennsylvania Ballet, by comparison, has a $14 million budget. On several occasions, when that company had financial trouble, Brown said, "some corporation jumped in and saved it. But nobody saves Philadanco. "You look around, almost all the institutions of color in the city are in trouble. They just don't take us seriously. And dance isn't something people take seriously." Brown, who will turn 86 on Christmas Day, would like a solid succession plan for her company. Daughters Marlisa Brown Swift runs the school and Dannielle Brown teaches, but neither wants to run the company. Brown is focusing on getting to 2020, when the company will turn 50 and the school 60. She recently signed a new three-year contract with the Kimmel Center to remain a resident company. After 2020, though, all bets are off as to who will take over. Philadanco has had several succession plans, but none has come to fruition. "When I step away, I think that's not my worries," she said, noting that the future will be up to her board. "I've given 50 years of my life. If people in the city, don't think it's worth keeping …"